The sun can be incredibly harsh one our face causing wrinkles, discoloration and even the possibility of skin disease to occur. In order to prevent your skin from getting hit hard by the suns ways, its important to wear SPF on your face on a daily basis. Many people think that SPF or some sort of sun protection is only necessary if it is really simmering outside, but that is incorrect. You need to protect your skin everyday, since it is vulnerable to the sun all the time. 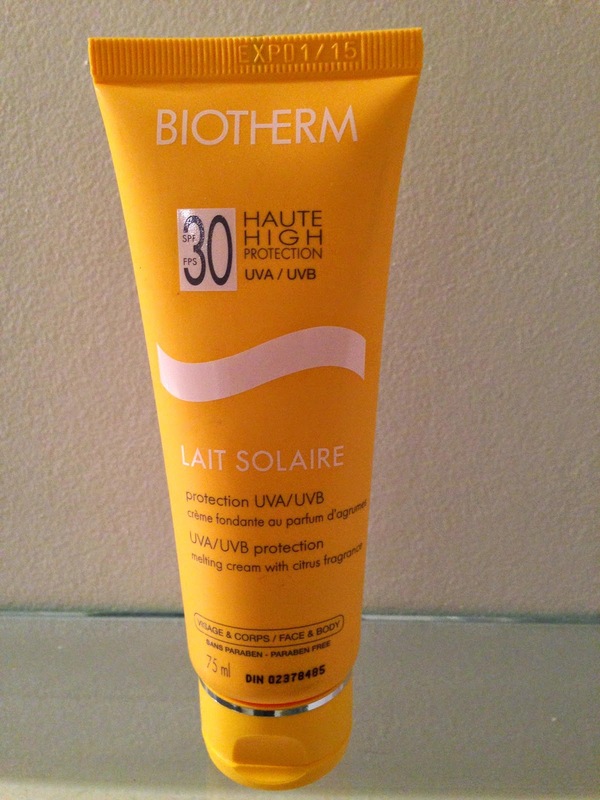 The sun protection that I am currently using is by BIOTHERM and has a high of 30 SPF. This sunscreen has UVB and UVA protection and can be applied to both your face and your body, which was a reason I decided to purchase this product. I like when products are versatile or offers you the ability to use it on other places on your body. However, please keep in mind it is fine if you choose to to use sun protection that is solely made for your face. I personally have been enjoying using this product, because it feels light on my face and I know that it is protecting me from the sun. I also like that it is SPF 30, but I still don't think it is high enough which is why I also apply a moisturizer that contains SPF 15. I think SPF 30 should be the minimum amount you wear and that you should go as high as 40 in order to protect your face, especially if your family has a history of cancer. Tip: If your not used to wearing sunscreen/SPF on a daily basis, or you are not sure how to incorporate it into your daily routine, try mixing your sunscreen with your moisturizer. This will make it feel like you are wearing less layers on your face and will prevent your face from feeling heavy. Cons: The only con about this product is that it only contains an SPF of 30, which can be low for some people. Overall, this product feels great on my face and I feel good knowing that my skin is protected. As it is 30 SPF, I recommend that you reapply it at least twice a day to ensure continual protection, or try to wear it in conjunction with a moisturizer or product that contains SPF. I hope you enjoyed my post and don't forget to subscribe to my blog!